The development will add Tampa’s first new office towers in almost 25 years and is set to reshape the city’s growing downtown. Correction 7/7/17: The article initially stated that Water Street Tampa was spread out over roughly one square mile. It is on nearly 50 acres. A $3 billion project will add Tampa’s first new office towers in almost 25 years and is set to reshape the city’s downtown. The nine-million-square-foot development will take just under a decade to build. Spread over almost 50 acres on the edge of the Garrison Channel and Hillsborough Bay, one of Water Street Tampa’s focal points is a new college and medical center via the University of South Florida. But the Morsani College of Medicine and Heart Institute is only part of the package: The development will include 3,500 condominiums and apartments, two hotels with 650 rooms in total, and one million square feet of mixed-use retail threaded between 13 acres of public space. According to a press release, the project will break ground this fall, with the college’s ribbon cutting set for a not-too-distant 2019. That building will be the first of the development’s 18 buildings to open. So who’s behind the project? The developer is Strategic Property Partners, an alliance between Jeff Vinik, the owner of the NHL’s Tampa Bay Lightning, and Bill Gates’s Cascade Investment. 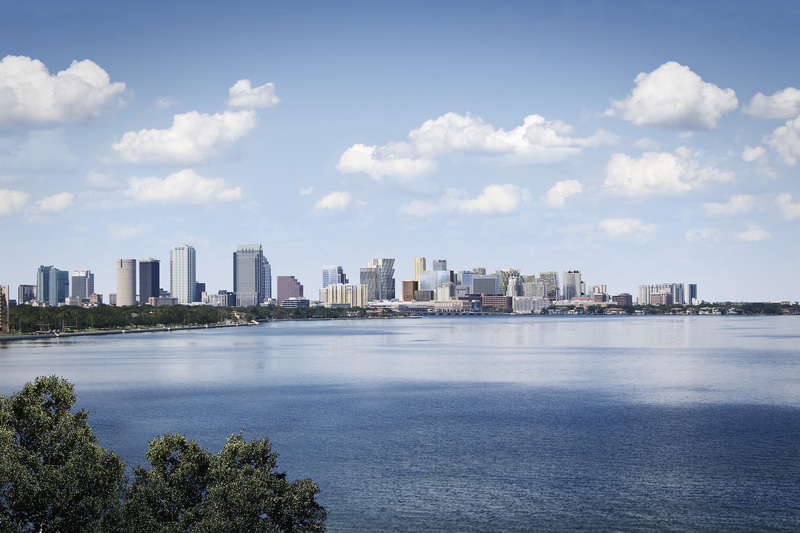 In addition to this mega-project, and sibling projects in the Sunshine State, Construction Dive notes that there’s a substantial number of new development in Downtown Tampa. The latest is Lafayette Place, a tri-tower complex near the University of Tampa, that will feature a hotel, apartments, office space, plus restaurants and entertainment programming over 1.8 million square feet. Water Street Tampa is seeking a special wellness certification through the International Well Building Institute (IWBI). Like the WELL building certification, its close cousin, the WELL Community Standard applies to new developments that encourage healthful behaviors, like walking, while mitigating environmental hazards like noise and air pollution that detract from quality of life. It’s a relatively new framework, but given how quickly wellness has spread from the crunchy margins to the mainstream, the designation is catching on: In March, Gensler and construction services company Structure Tone scored the country’s first WELL office certification for a New York City building. At Water Street Tampa, all buildings will be cooled by a central facility, eliminating the need for cooling towers atop each individual structure. Instead, the developer promises green roofs with views over the water and downtown.